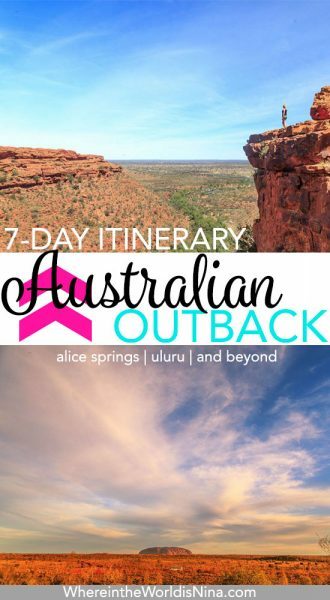 A Legendary 7-Day Outback Road Trip Itinerary (Australia) | Where in the World is Nina? So what’s holding you back? You don’t need a tour to visit this incredible area, here’s our itinerary for the perfect Outback self-drive tour. The flight into Alice is an adventure in itself as you get your first look at the martian landscape you’ll soon be seeing up close. 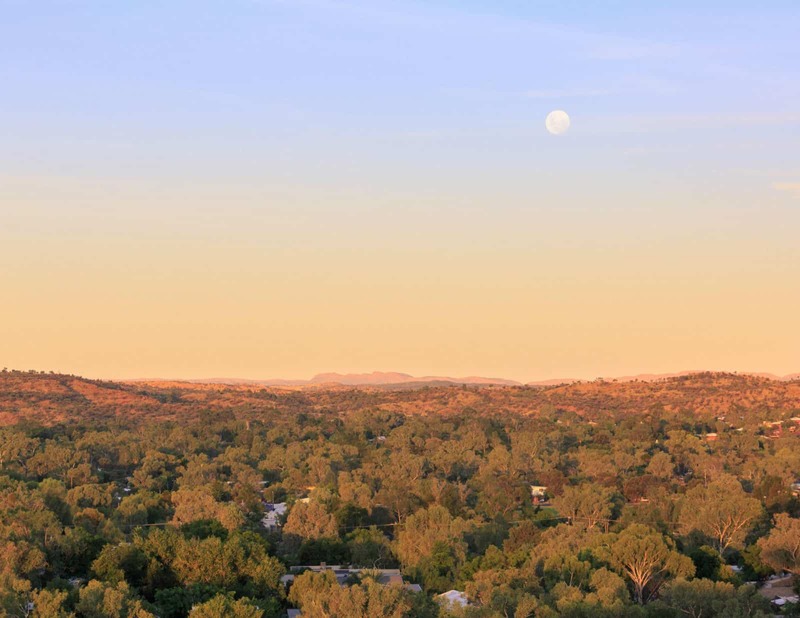 Having landed the first day is a good opportunity to explore the town and see some of the best things to do in Alice Springs. These two museums are a great introduction into understanding how hard simple things are in this part of the world. As people live so far apart, health services have to be delivered by air and school classes by radio (well, now the internet). Try and time your visit to the School of the Air with when a live class is happening, and the Flying Doctors Museum after that. The highest point in the town offers great views of both the East and West MacDonnell Ranges as well as Alice Springs. It’s a great spot for sunset as the light turns the cliffs golden before exploding into some of the most magical sunsets we’ve ever seen. Anzac Hill is the perfect spot to explore during your Uluru trip. Now that you’ve seen the best things to do in Alice Springs town centre, it’s time to hit the road and explore a little further afield into the MacDonnell Ranges. Take a drive along the Ross Highway where there are loads of incredible stops to choose from. Our favourites are Emily and Jesse Gap just 15km out of the town centre. The Aboriginal rock art engravings here have been really well preserved and tell the story of how Alice Springs was formed. 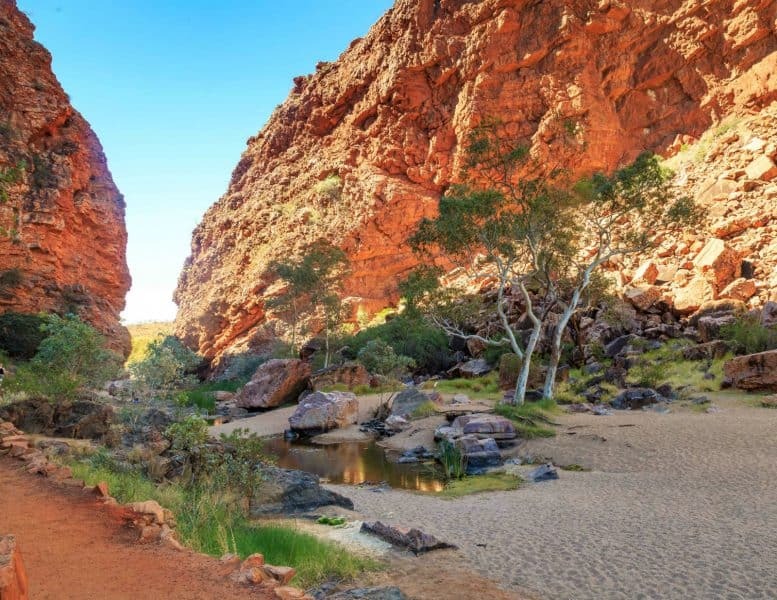 Head to Trephina Gorge for some stunning outback hiking as the views from the 2km Trephina Gorge loop walk are worth the drive alone. Head on to Ross River resort for a spot of lunch and a dip before making your way back to Alice. We think this is the best thing to do near Alice Springs and there’s no experience more humbling than meeting Brolga and his sanctuary for orphaned kangaroos. When females kangaroos are hit and killed in car accidents, they often have a joey that survives in the pouch. 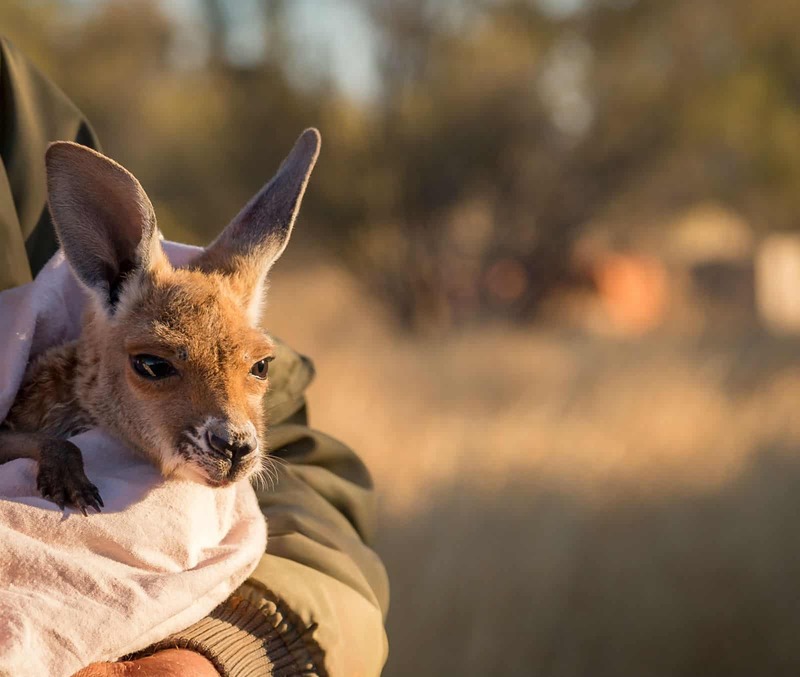 The Kangaroo Sanctuary rescue these orphan joeys and give them a second chance at life. One of the most wonderful experiences you can have in Australia is cuddling one of these little rescue joeys. Tours take place Monday to Friday at sunset and include a walk through the beautiful Aussie bush, joined by the rest of the kangaroo mob. It’s an experience you won’t forget. Note: Any visits to the Kangaroo Sanctuary must be pre-arranged with Centre Bush Bus. You cannot visit the Sanctuary outside of a group tour. The Kangaroo Sanctuary is a place to celebrate the beauty and cuteness of these kangaroos. Just a short stroll from the car park, Simpson’s Gap is a magnificent gorge, it’s one of those places where you can just sit and stare for hours. The landscape just feels ancient. If you look carefully you’ll spot endangered Black Footed Rock Wallabies hoping around the rubble. If you’d like to know a little history of the area, time your visit to coincide with one of the free ranger walks. 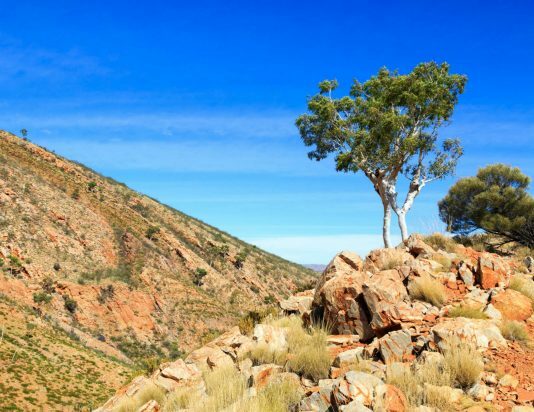 This is another of our favourite outback hiking spots. The Ormiston Pound walk is a 3-hour loop track which takes in the best of the scenery. You’re unlikely to see anyone one else on this track, which really adds to the feeling you’ve made it out into the great Aussie wilderness. Once you’ve finished the perfect place to cool off is waiting for you. The gorge itself is one of the most magical swimming holes in all of Australia. The water is pretty cold even in summer so grab a float if you want to stay in for a while. It’s an easy spot to while away the whole afternoon. There’s nowhere better to watch the sunset in the West Macs than Ellery Big Creek. In the evening, the crowds all disperse and you’ll get this stunning area to yourself. The water reflects all the colours and it’s an incredible spot to sit and peacefully contemplate. The twilight is captivating. 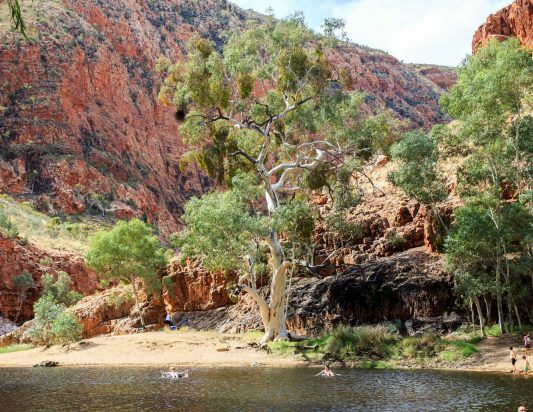 Enjoy the red cliffs and placid waters at Ellery Creek. Glen Helen Homestead is not exactly luxury accommodation but it’s a true Outback experience. In the evening the food is superb is often followed by live music. They’ve also got board games if you prefer a quieter evening. Bonus points for staying up until the middle of the night to see the milky way rise over the red cliffs at Glen Helen (this was a pretty magical experience). 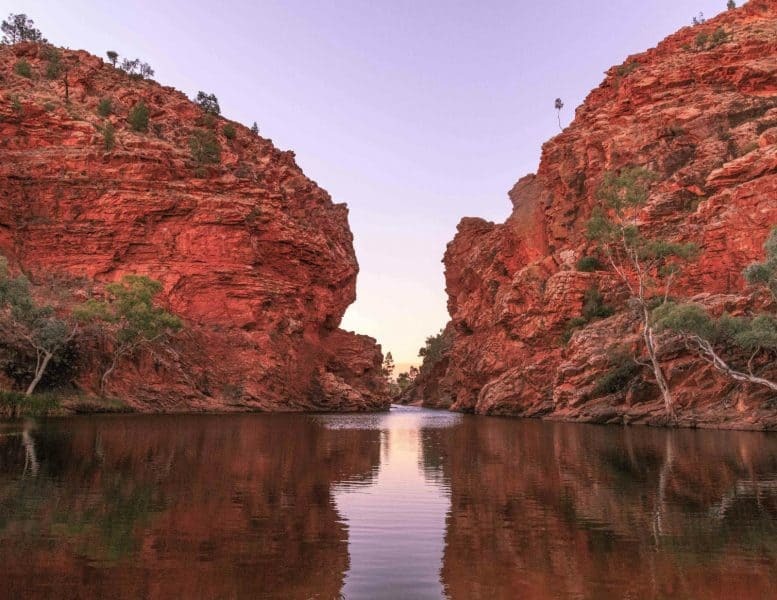 After four days you’re edging closer to your Uluru trip finale and the self-drive tour from Alice Springs moves from the West MacDonnells to another epic spot – Kings Canyon. There are a few things to do in the West Macs before heading there in the afternoon. This is just five minutes away from Glen Helen so the early start is manageable. 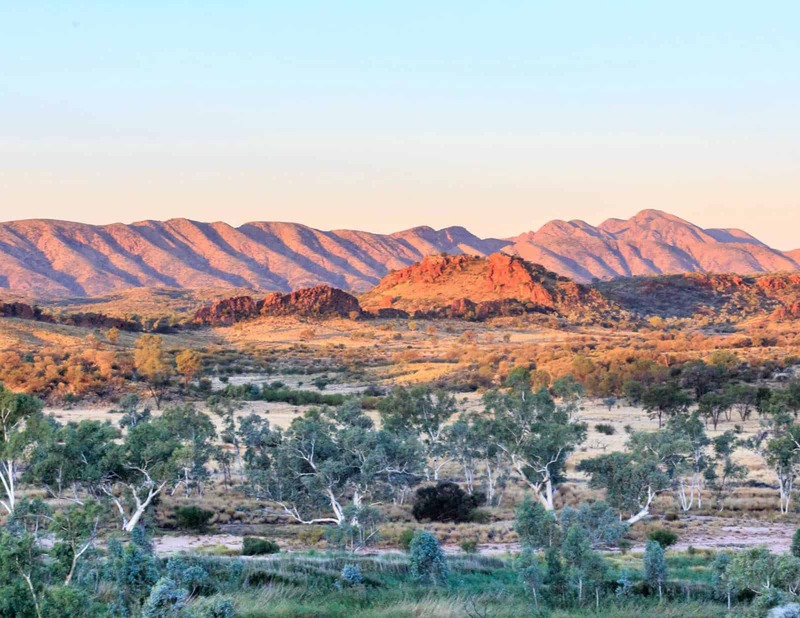 As well as a great view of Mount Sonder, you also see an explosion of colour, the beautiful yellow sand around the creek, the greenery of the gumtrees, the red cliffs and the clear blue outback skies. The great view of Mount Sonder! For the adventurous, take the Mereenie loop to Kings Canyon. This will put the “epic” into your epic self-drive tour as the road is so bad you need a 4 x 4, a permit, and a lot of patience. A picturesque drive at Mereenie Loop. 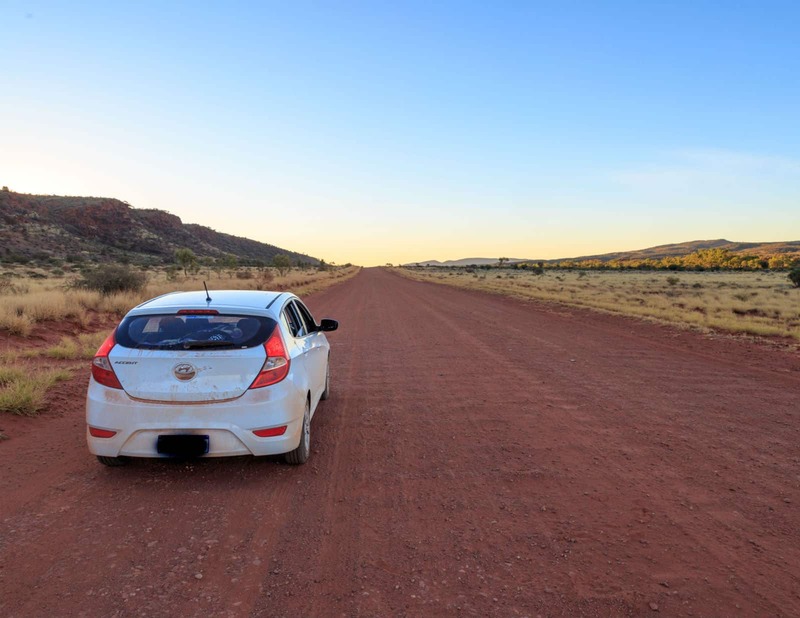 For nearly 200km you’ll drive over unsealed roads and corrugations that will shake your core for hours. I can honestly say it’s the worst road I’ve driven on, but the scenery and views are unparalleled. On our trip, we encountered wild dingos, kangaroos, camels and even brumbies (wild horses). If you haven’t fallen in love with the landscape by the time you’ve finished the Mereenie Loop, then you never will. The dark red earth and outback vegetation, mixed with endless clear skies is unlike anywhere else on earth. At the end of the Loop, you’ll find yourself at Kings Canyon. 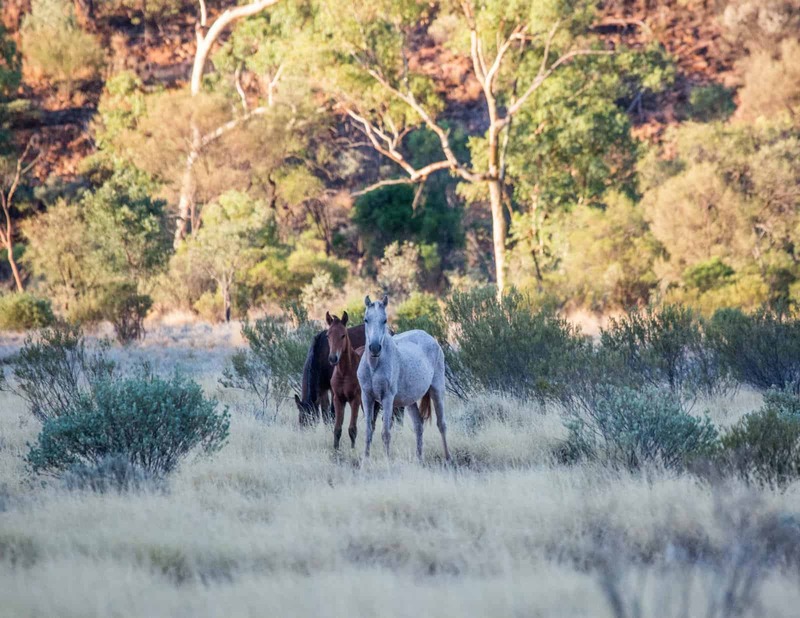 Brumbies aka wild horses roaming the Outback. If you don’t have a 4 x 4 then you will need to back track slightly to the main road, where you can find a fully sealed route to the canyon. You’ve edged a little closer to Uluru on your Outback road trip and it’s in Kings Canyon when you feel even further away from civilisation. Although there’s a petrol station, hotel and a restaurant, you’re a couple of hundred kilometres from the nearest town! 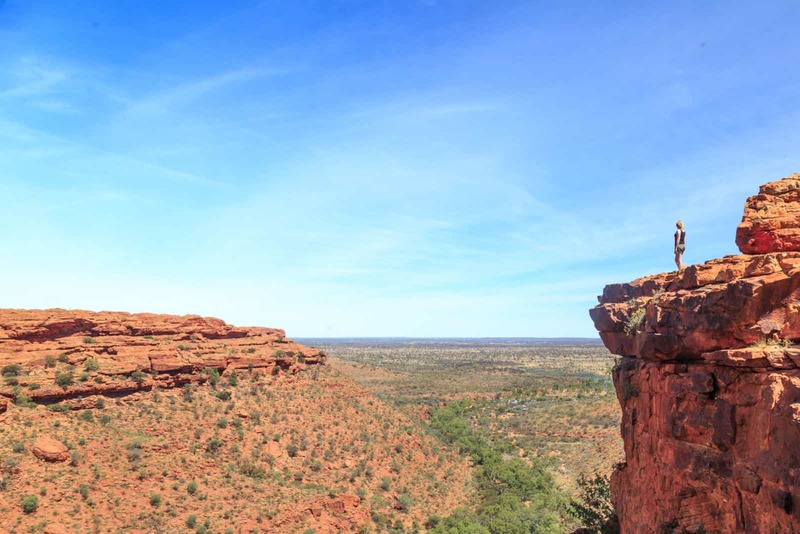 Kings Canyon is a highlight of the red centre and there’s a lot to explore. The best thing to do is the Kings Canyon Rim Walk, an epic trail that takes you to the top of the canyon offering mind blowing views and plenty of places to get some classic edge of the world photos. It’s best to do this early or late in the day as it’s very exposed and the rock can radiate the heat. The rangers often close the trail after the temperature goes above 30C, so plan your hike wisely. Enjoy outdoor hiking at the Kings Canyon Rim Walk. 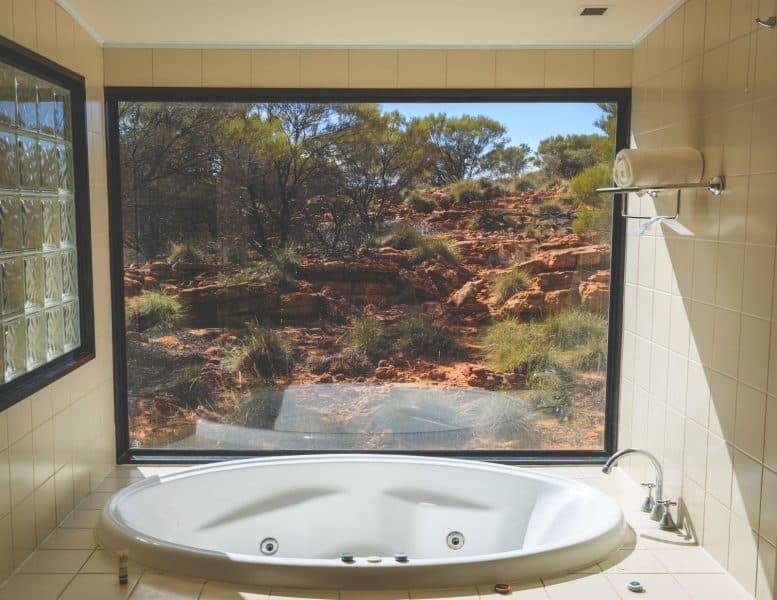 What better way to escape the midday heat than to jump into a jacuzzi in your room with its own Outback view?! This is in the deluxe spa room at Kings Canyon Resort. Time to take in another epic sky show. 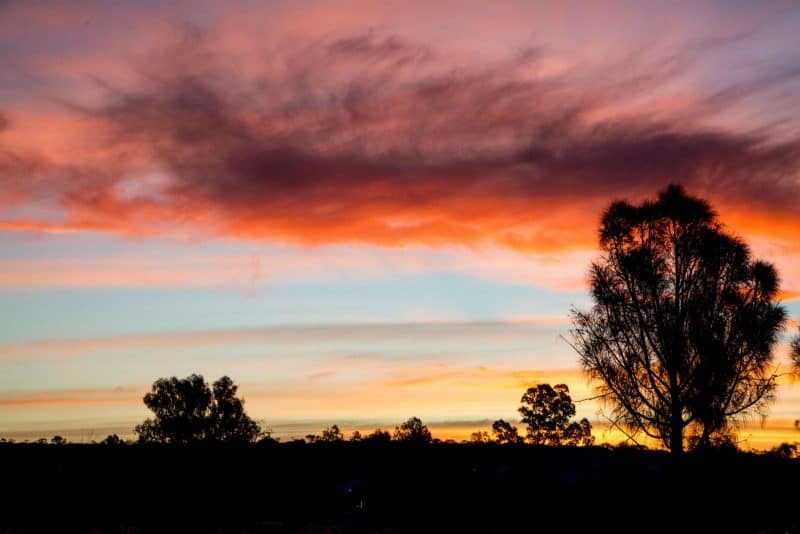 We experienced sunsets that were out of this world at Kings Canyon Resort, so head out to the viewing platform and watch the sky put on nature’s best light show. If you feel like celebrating, and this landscape really has that effect on you, you can even buy yourself a glass of champagne here. 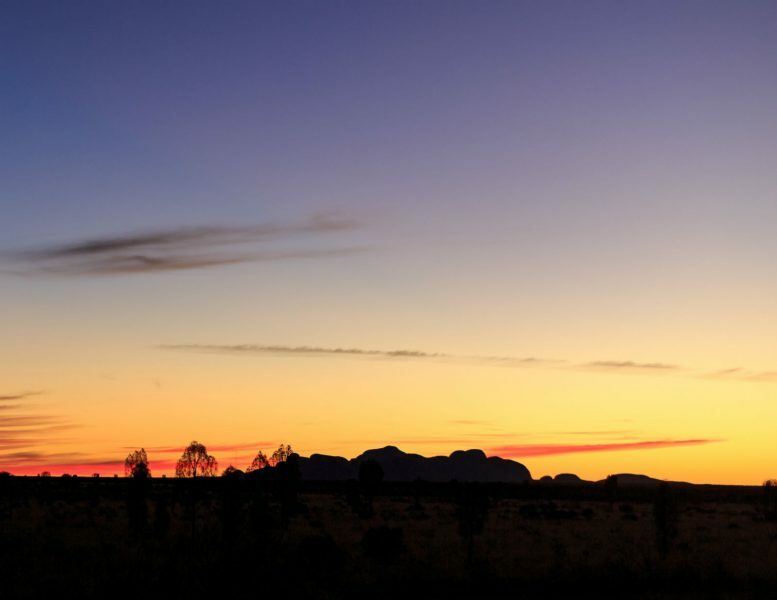 Experience incredible sunsets on your Uluru self-tour from Alice Springs. Make an early start and drive the final leg to Uluru. The roads here are sealed and the scenery continues to be fantastic. Look out for Mount Conner along the way, otherwise known as ‘Fooluru’, for its striking resemblance to the more famous monolith. Once you’ve arrived at Yulara (the nearest village to Uluru), you’ll have made it to the finale of your grand outback self-drive tour. 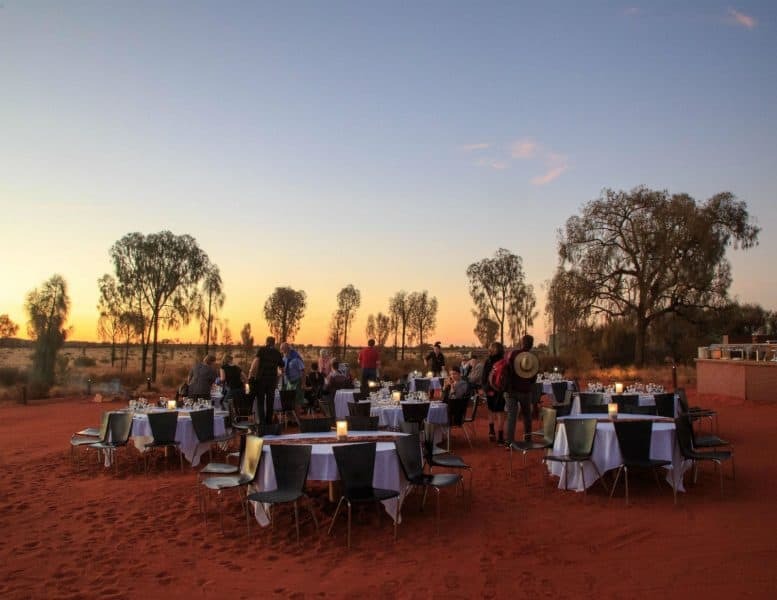 If you’re going to make a splurge at Uluru, make it the Sounds of Silence Dinner. It’s genuinely one of the greatest dining experiences we’ve ever had. You start the evening just before sunset with a champagne glass in hand to watch as the colours of the landscape and Uluru slowly begin to change. You’re greeted by the traditional owners of the land and are then moved to your table for dinner. We were lucky to have a view of the stunning Kata Tjuta (more on that later) as the sky lit up yet more vivid colours. 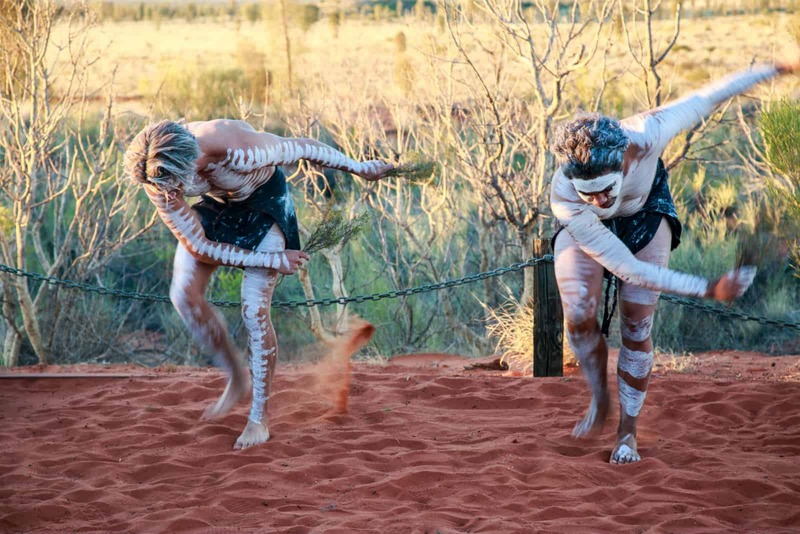 Heartwarming welcome at Sounds of Silence during your Uluru trip. You then tuck into a lovely meal, mains are buffet style so it’s a great place to try a few of the more unusual Aussie offerings. You’ll find kanagaroo and even crocodile on the menu. You are serenaded with the unique sound of the didgeridoo (the didgeridoo is actually from the northern part of Australia and requires permission of the elders from the area to play). It’s the perfect music to compliment the amazing outback scenery. Enjoy an evening of dining at Sounds of Silence under the sparkling outback sky. Once the meal is finished, the lights go out and we were blown away by the sight of the milky way, it’s probably the most stars you’ll ever see. Once your eyes have truly adjusted, experts take you through the constellations and the indigenous stories associated with them. You learn about how they timed hunting and gathering seasons with the rising of different constellations and used the stars to guide them through the landscape when it was cool enough to walk. It’s an amazing experience not to be missed. Sunset at Kata Tjuta is one of the best things to do near Alice springs. 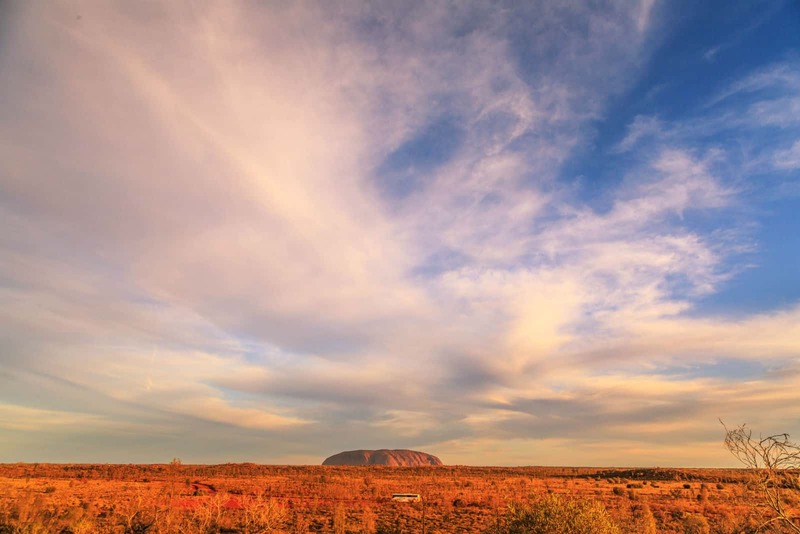 It’s the final day of your Uluru Trip, so make the most of the precious hours you have left! Ok, it’s likely that you haven’t had too much sleep after last night’s dinner, but you can catch up on sleep later! Set the alarm clock nice and early and head out to the park to see sunrise. Once at the viewing platform, you’ll see how Uluru changes colour as the sun changes position in the sky. You’re already at Uluru and it’s the coolest time of the day so now is perfect to do the base walk. It’s hard to really explain how incredible Uluru is and you’ll understand why the aboriginal tribes believed it was a part of the creation story. The base walk is a superb way to see it from all angles and you’ll discover waterholes and ancient art along the 10km loop. If outback hiking is not for you, you can just walk a short distance to the first waterhole before returning back to the car. The free ranger walks are also highly recommended. 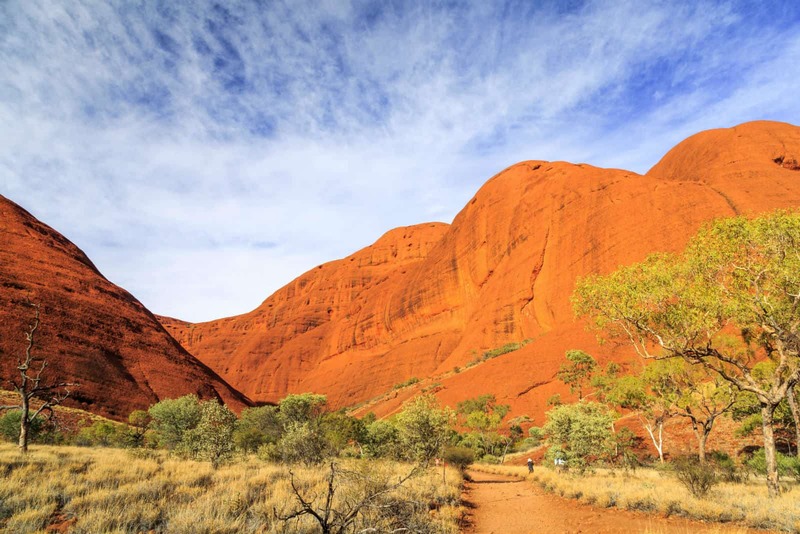 A number of walks allow you to fully explore Uluru and the Outback. It’s the last morning before flying out but if you have the energy for another early start you can just about squeeze in the 7.4km Valley of the Winds loop walk. Shortly after sunrise is the best time to head to Kata Tjuta as the temperature is still cool and there’s not many people around. Before arriving, most people think that Uluru is the only thing that stands out on the landscape, but Kata Tjuta is arguably as impressive as Uluru. Kata Tjuta is a collection of huge red rocks that provide interesting trails and valleys to explore. 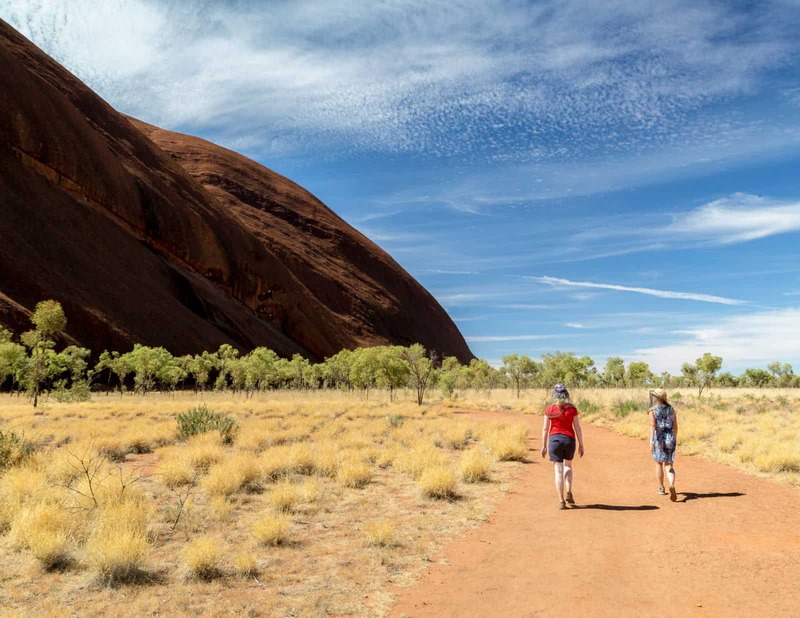 Give yourself a couple of hours to hike around this area taking in another important piece of aboriginal heritage and something that would be on most people’s bucket list if it wasn’t for the magnificent Uluru next door. Look out for the cute perentie lizards along the way. 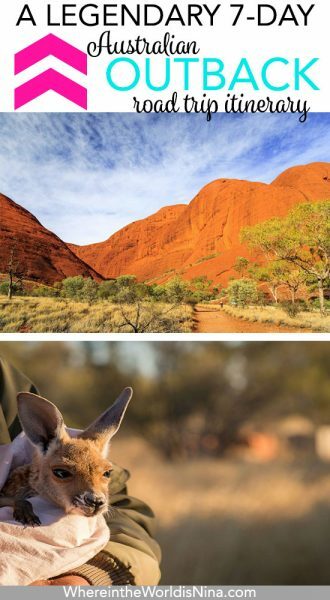 Kata Tjuta National Park is one of the best things to do around Alice Springs. Our final tip would be to make sure you get a window seat on the plane. You get a birdseye view of Uluru and it’s the perfect end to your trip. We hope you can see how easy and rewarding it is to do a self drive outback tour. Are your taking an Outback trip soon? Let us know in the comments! We’re Cat and Joe, originally from the UK but currently living in Australia. In 2012 we bought a one way ticket to Istanbul and spent a year making our way through Asia before arriving in Australia, where we have been living ever since. 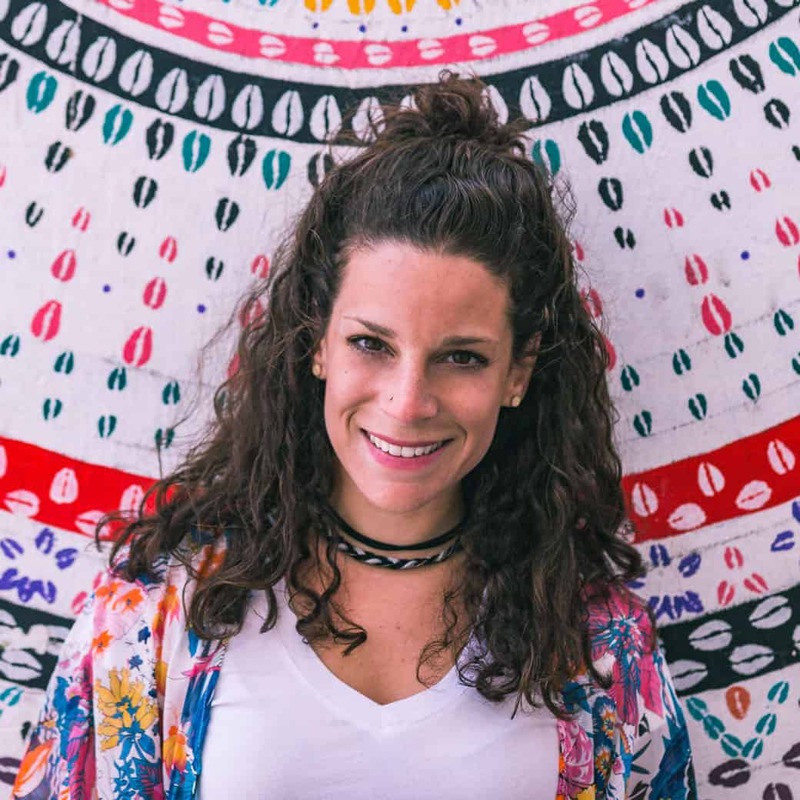 We’ve spent the past four years exploring this amazing country where you’ll most likely find us out on the hiking tracks or planning our next adventure over a large flat white! Don’t forget this post! Pin it for later by clicking the picture. This trip sounds fantastic! Can you do this itinerary in early December or is it too hot? Thank you for such a great itinerary! I will be using it as my base for our 7 day trip! Really hits many of the areas I was thinking of and so many insights! Do you think that we could do the Uluru base walk and Kata Tjuta on the same day or is it packing in too much? And which was your favorite gorge?